Aggressive captive-breeding is crucial for these very special macaws. Sometimes we become so absorbed in the daily work of managing and caring for our parrot trusts that we lose sight of the finer ambitions of our lives' work. So it is with our red-fronted macaws; over 10 years of working with them just melt into a daily routine. It is easy to check on them at each feeding, and make sure they are in good health and are comfortable. However, much more care than that has contributed to the overall picture. This is a species still in critical need of intense avicultural attention. Not only are red-fronted macaws rare birds, but they are difficult to successfully breed in captivity. Many of the conditions that are required for their reproduction are difficult to duplicate in an aviary. 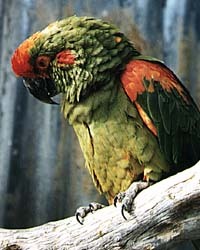 Virtually unknown for many years, in 1970, the red-fronted macaw was again brought to the attention of aviculture. Dr. Roland Romero, a South American aviculturist, was shown a live bird by a Bolivian trapper. Dr. Romero surmised it to be some type of hybrid, having never before seen a red-fronted macaw. Later, Dr. Romero located a skin in the British Museum of Natural History and realized it was not a hybrid but actually, for macaw breeders, one of the most exciting finds of this century. The finding of the skin confirmed the rediscovery of a truly new species: the red-fronted macaw. The early naturalists, such as the famous 18th century's Buffon and the 19th century's Darwin and Audubon, did not collect live specimens. These people were mainly interested in the collection of pelts for identification purposes, along with the collection of data. These specimens, by and large, are stored in drawers in natural history museums worldwide. It wasn't until people like Clyde Beatty and Frank Buck in our century came along, together with advanced air transportation, that delicate live animals could be collected, shipped safely and displayed publicly. This ignited the spark for collecting species and maintaining them in living, viable collections, both privately and publicly. These early collectors were not necessarily interested in pairs or propagation, since the wildlife they were collecting was still available in abundance. In our minds, the father of modern zookeeping is Gerald Durell, a legend in his time. In addition to a lifelong devotion to collecting, he formed the Jersey Wildlife Trust, which is still providing the world with the offspring of many endangered species. He wrote scores of anecdotal books about wildlife collecting and his sojourns around the world, fascinating lively reading for people willing to search out his books (try Powell Books in Portland, Oregon). Human beings have been collecting and domesticating animals since we first moved into caves. The tradition continues. The red-fronted macaw's habitat was located in a remote section of eastern Bolivia, just about in the middle, a small area measuring approximately 80 miles in length by 40 miles in width. The area is smaller than the actual city limits of Phoenix, Arizona. I believe this to be the smallest total habitat area for any of the macaws. The mountainous range varies, from 300 to 500 feet, consisting of arid desert scrubland, with sparse dry woodlands at the higher elevations. Little surface water is to be found; the red-fronted macaw is not a "rain forest" creature. The seasonal rains provide only an intermittent surface water supply. The arid conditions have kept the population of humans in that area at bay, thus allowing the birds to exist in seclusion for such a long period of time, known only to the local inhabitants. Where there are small subsistence farms of peanuts and corn, they will come in and help themselves. Unlike many of their arboreal cousins, these spunky little birds enjoy digging in the dirt for food and are quite comical to watch. The indigenous people are not known for keeping them as pets, nor are they rich enough to own the guns needed to exterminate them for a food source. When the flocks of red-fronted macaws were first relocated by outsiders in the early 1970s, population counts were made. The total populations were estimated to be between 3,000 and 5,000 individual birds. In the mid to late 1980s, the population estimate had gone down to between 1,000 and 3,000 birds. With discovery, populations quickly decreased. One local inhabitant interviewed in 1981 indicated he had seen flocks numbering 200 birds each day, five to 10 years previously. Now, he was seeing only 30 or 40 birds a day. The red-fronted macaw nests were high up in sandstone cliffs, which made the collection of babies difficult. Adults were captured in mist nets for the export trade. High prices, rivaling that of the magnificent hyacinth macaw, made it an extremely lucrative target for local trappers. This helped to decimate the original breeding population. In the early 1980s, when we obtained our first pairs, they were the highest priced macaws in our collection. The aviaries in which the authors' red-fronted macaws are housed are not any smaller than any of the other cages for the larger macaws. Pictured is a female. 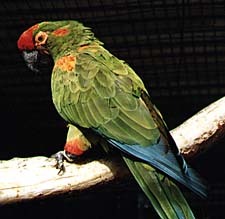 The red-fronted macaw is not a large parrot; it is the smallest of the large macaws. The torso is green, supporting an orange patch on its head and on the bend of the wing. A bright orange dot the size of a dime is found on either side of the head just behind the ears, and their little legs are also orange. As ours have matured, they often get miscellaneous orange feathers on their breasts. They look more like they were designed for a circus clown act. They act like little clowns, too. They're always the first to wake up in the morning and call for their breakfast! 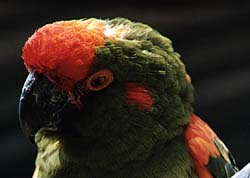 Macaws, like poultry, are aware of the pre-dawn infrared light. I really have to get up early for these guys. Every time I go in the cage to clean the water dishes and scrub the food trays, the red front pairs are fighting over which one gets to pull my hair. They are exceptional mimics; if they pinch you, and you yell, "Ouch!" they quickly learn to pinch you and yell "Ouch!" before you can. If you laugh after they yell "Ouch!" they will pinch you, yell "Ouch!" laugh and scamper away. They do keep us amused. The domestic babies love to crack buttons. Sometimes finding a shirt one can wear off the farm is difficult. We once asked a fellow macaw breeder with whom we had made a breeding exchange how Mr.Greenjeans (our first red front baby ) was. "I let him live," was the humorous response. They are really quite mischievous. The aviaries in which ours are housed are not any smaller than any of the other cages for the larger macaws. Our first successful breeding did not take place until our first pair was in an 8- by 8- by 16-foot cage, nestled between two large Valencia orange trees. Three years after the original wild-caught pair was acquired, they laid two eggs (in April). We did not know how old these birds were when we acquired them. Both babies hatched and were parent-reared until early July, when it became too hot outdoors for them. The babies were then removed for hand-feeding. Three more years passed before we were successful again, with two more pretty little eggs laid in April. Once again the early Scottsdale hot weather necessitated our removing the babies for hand-feeding by the end of June. Our pair of unrelated domestic birds, hatched in 1987 and 1988, have laid at age 6; no offspring were produced--a common occurrence for first nestings in all macaws. Red-fronted macaws, at their adult weight, do not weigh more than a pound (456 grams)--a lot of punch in such a little package. Should you be the proud owner of a single bird, you should be aggressively looking for a mate for it because in the wild, this species of macaw, we believe, will be extinct during our lifetime. If you find yourself unable to keep your bird in a breeding situation, serious consideration should be given to donating it to Parrot Preservation Society, or another nonprofit group dedicated to the preservation and procreation of these wonderful, highly endangered macaw species. This data is from domestically raised babies. Babies were parent-reared for 12 days, prior to removal for hand-feeding. 7/3/87 Full feathering; head area above the cere is black, one small red feather only. 7/15/87 Playing with a seed today; cracked and ate it. No red patches on ears or nose. Small amount of red on shoulders, no red on legs. Color is dull compared to the adults. 8/9/87 Starting to eat formula by itself. 8/23/87 Tiny red feathers above the cere, just barely starting to show color. 9/5/87 15 Is weaning now, eating well by itself. 9/21/87 15 Eating vegetables on its own now. 10/31/87 Pretty much weaned now. 12/1/87 16 Weaned; finish weight is 1 pound. 12/10/87 Chromosome sexed by Mark Valentine; bird is a male.